It's time again for You Want Pies With That? This month's theme of "Family Favorite Pie" was chosen by Natalie of Oven Love, which gave me an excuse to pester my mom to dig through some old family recipes. Roll out pastry to 1/8" thickness. Fit into an 8" pie pan, trim, and elaborate edge as desired. Arrange apples in the unbaked shell. Mix together sugar, flour and nutmeg, stir in lemon juice, and pour over apples. Dot with butter. Bake in hot oven (450°) for 15 minutes. Then reduce heat to 350° and cover with slightly larger tin for 30 minutes. Remove cover and bake 15 more minutes. For the crust I used Alton Brown's Pie Crust Recipe. I made only minimal changes to either recipe. I substituted Earth Balance margarine for the butter and shortening and used a nine inch pie pan, since I don't have an eight incher. To fill up the pan, I increased the apples to about five cups. Since I didn't have a larger pie pan, either, I covered it with aluminum foil for the 30 minutes at 350°F. This pie turned out to be absolutely perfect in its simplicity. I was initially sceptical of an apple pie that didn't have any cinnamon, but the whisper of nutmeg lets the flavor of the apples shine through. My mom has agreed to send the red notebook to me, and I can't wait to see what other treasures are waiting inside. Be sure to see all the other tempting dishes that the creative tarts at You Want Pies With That? bring to the table this month! That looks amazing! I've never tried making an apple pie without cinnamon, either. Yum! My husband would kill for this pie right now! He has been talking apple pie nonstop for days. Mmm, it looks wonderful! How appropriate, using your great-grandmother's recipe. Aren't old family recipes boxes the best? Another fab apple pie. 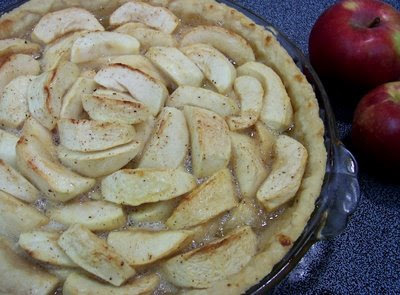 Ths groups is giving me a list of new apple pies to try and this one is so on that list. Great job! This is a good pie! 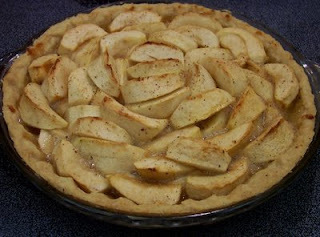 Another one that I have tried is http://allstarrecipes.blogspot.com/2009/07/dutch-apple-pie.html. A little different that they use tenderflake pie shells, but it is good too!